To list a new product on Play.com you will need an authentic barcode number. A barcode number (or EAN Number) is a unique 13 digit product identification number. 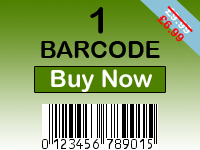 If you need a barcode to list your product on Play.com then you have come to the right place. Here at Get A Barcode we specialise in EAN and UPC Barcode Numbers. We provide both the 13 digit EAN barcode number and 12 digit UPC barcode number with every order. All barcode numbers are sent instantly upon receipt of payment. Get A Barcode Ltd is a UK registered company which has been trading for several years, specialising in the sale of genuine barcode numbers.